Strapless Dress/Maxi Skirt "To Matisse with Love"
This beautiful Strapless Maxi Strapless Dress is stunning! You Can even wear it as a Maxi Skirt too! Made with 90% Rayon and 10 Spandex. Machine was in cold water and hang dry. Fits true to size. If in stock, this item ships out sooner. This beautiful Strapless Maxi Dress is stunning! You Can even wear it as a Maxi Skirt too! Made with 90% Rayon and 10 Spandex. Machine was in cold water and hang dry. Fits true to size. If we have this item in stock, we will ship out next day delivery. If not in stock, it takes 3 weeks to ship out to you. This lovely chiffon Sun Dress is exquisite! You can wear it also over your swim suit, or simply as a stunning Sun Dress! Hand wash in cold water, hang to dry. Will not fade, wrinkle nor shrink. If we have this item in stock, we will ship out on the next day. Otherwise, it takes 3 weeks to make and ship to you. This beautiful Chiffon Sun Dress is beautiful. You can also wear it with white shorts or Blue Jeans for an amazing look as a Top if you order it in a smaller size! Otherwise it is Fabulous as a Sun Dress! If in stock this item will ship out next day. Otherwise, it takes 3 weeks to make and ship out. Care Instructions: Cold water, hand wash, hang to dry. 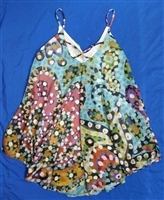 This top runs larger than normal, so please order one size smaller for best fit. Sun Dress (Chiffon) "Groovy Kind of Love"
Sun Dress (Chiffon) "To Matisse with Love"
Sun Dress (Chiffon) "Color Me Beautiful"
Smock Dress with Flared Skirt "Radiance"
This beautiful Smock Dress is very feminine. Great to wear to the office, or out to dinner...even as a day dress to go out shopping while looking fabulous! Made with Lycra, Polyester fabrics to create a soft and beautiful figure forming dress that will make you feel beautiful! If in stock, this item ships out on the next day. Otherwise, it takes 3 weeks to make and then it will ship out to you. Smock Dress with Pockets "Dream Flowers"
This lovely dress is made with 90% Polyester / 10% Spandex and has a nice figure fitting look. The sizes run "one size smaller" so when ordering...order one size larger. If in Stock, it will ship out on the next day. Will not fade, shrink nor wrinkle. Care of garment info: Machine wash in cold water, hand dry. Smock Dress with Pockets "Groovy Kind of Love"
Smock Dress with Pockets "You Sang To Me"
Halter Dress (Chiffon) "Hello Matisse"
This stunning Halter Dress made with Chiffon fabric is very beautiful on! Wear it to a special event, out to dinner or, even as a day dress and I assure you, you will look absolutely striking! Made out of 100% Polyester Chiffon fabric. Care Instructions: Hand wash in cold water and hang to dry. No color fading, no fabric shrinkage, no fabric wrinkling either! “Look Fabulous, Feel Beautiful!” If this item is in stock, we ship out on the next day. Otherwise, we will make it (it takes 3 weeks), then we will ship to you. Halter Dress (Chiffon) "Groovy Kind of Love"
This beautiful Chiffon Halter Dress is Stunning. You can also wear it with white shorts or Blue Jeans for an amazing look as a Top if you order it in a smaller size! Otherwise it is Fabulous as a Sun Dress! If in stock this item will ship out next day. Otherwise, it takes 3 weeks to make and ship out. Care Instructions: Cold water, hand wash, hang to dry. This top runs larger than normal, so please order one size smaller for best fit. Maxi Dress Short Sleeves "Radiance"